Miss Julie's Let's be Safe - Fire Drills program is designed to reinforce her message that school is a safe place for students. 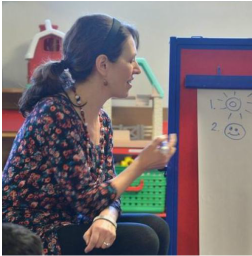 She created her program at the preschool where she teaches in Redmond, Washington. The first draft of her Let's be Safe - Fire Drills Guide was included in the Pilot Test Project with Lamar Consolidated Independent School District (LCISD) in Texas during 2015. The group of principals, assistant principals and administrators from LCISD previewed Miss Julie's Let's Be Safe - Fire Drills Guide, provided excellent suggestions and encouraged her to develop Let's Be Safe - Fire Drills for kindergarten teachers. Thank You Trudy Harris and Irma Nurre for coordinating the Safe to Learn Pilot Test Project with selected Principals, Assistant Principals and Administrators from Lamar Consolidated Independent School Distinct (LCISD) in Texas. Thank You Kanun Andrade, Jorge Martinez and Jessika Savage. Their amazing talents, excellent digital photography and video is was used to develop her first sample Let's be Safe - Fire Drills Guide developed the Pilot Project. After viewing the video, it was recommended that a video be included for future training. Patti's illustration of they graphic character that appears now and then in Miss Julie's Let's Be Safe - Fire Drills Guide added a special accent to the Guide that included still outstanding and expressive photos by Kanun Andrade, Jorge Martinez and Jessika Savage. A Special Thank You for Miss Julie's students and parent volunteers who participated in the Fire Drill on the day the Safe to Learn team filmed for the pilot test project. And a very special "Thank You" Miss Julie for all you do every day to keep your students safe. Thanks to you they not only remember what do do during a fire drill, but when they leave school, have learned to feel a little safer. You taught them about the importance of safety.